On the very last morning, a special assembly was conducted entirely by Year 6, before they leave Ysgol Gymraeg to start at the secondary schools after the summer. Highest football scorer – Siôn E.
Most influential player – Will C.
Rugby award – Gwydion H.
Cross-country running award – Lisa C. and Siôn E.
Swimming award – Sioned W.
Warm congratulations to the five winners and best wishes to all pupils who will be moving up to the secondary schools – we will miss you all in September. We welcomed Tomi Turner, who is a former pupil, to the school to share a very important message regarding seaside safety during the summer holidays. With Aberystwyth being a seaside town, Tomi’s message was crucial to all the school’s pupils, with lessons also being learnt with regards to identifying special flags and dangerous waves. Thank you, Tomi, for your visit and for your extremely relevant message again this year. Following weeks of bike safety lessons held by Ceredigion Council instructors, Year 6 pupils had the opportunity to practise their new skills as we went on a bike ride along the cycle route to Glan-yr Afon Estate and then on to the prom, calling at the ‘Hut’ for an ice-cream on the way back to school. Thank you especially to Terry, Catrin and Malcolm for their work in instructing the pupils to cycle safely during the summer term this year. With it being the end of term and the end of the school year, the Police visited school today in order to remind pupils to keep safe over the summer. The Police reminded us to keep safe during our six weeks of holidays, and answered any concerns or questions the children had. We’re very grateful to them for coming to school. A very succesful barbeque was held on a lovely summer's evening this year. Hundreds came to enjoy the feast of pork, burgers, salad, fruit, ice cream, puddings and more. Many thanks to everyone who supported the evening, especially Aled Morgan the local butcher and the members of the PTA for their tiredless work during the year and for all their preparations in ensuring a succesful evening. Following our fundraising day at the beginning of the week, a gang of Year 6 pupils joined Rhys Meirion and other celebs as they raised money for the Welsh Air Ambulance. In the picture the School Council are seen presenting a cheque of £300 to Iolo Williams. Year 6 walked along Plascrug Avenue, through the town, along the prom and up Constitution Hill with the walkers. Click here to see the gang sitting at the top of Constitution Hill with a wonderful view of Aberystwyth in the background. 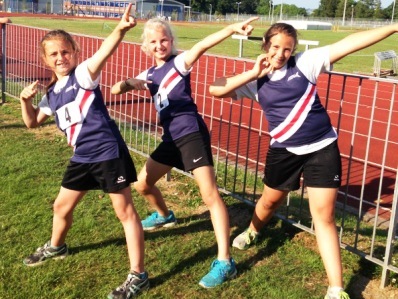 Following their success at the Dyfed Sports competition recently, three Year 6 girls were given the opportunity to represent the Dyfed team in an inter-county athletics competition against the West Glamorgan team in Carmarthen. Congratulations to Lisa for coming second in the 100 metres sprint and second as a member of the relay team; Caitlin for coming fourth for throwing the shot put, and Gwenllian for coming sixth in the hurdles race. 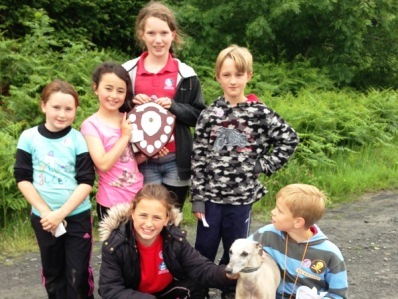 Some of the school’s pupils have been busy competing in an orienteering competition recently. Congratulations to Gwenllian, Rosa and Dylan from Year 6, George from Year 5, and Hannah and Lucie from Year 4 for being members of the winning Ceredigion schools team which won against the Powys schools team in an exciting competition held in a forrest above Tre’r Ddôl. On the 16th of July 2012, year 4 went on a school trip to Ynys Hir. Ynys Hir is a nature reserve which looks after animals, plants and insects. Throughout the day we had the chance to search for insects and animals in the woods and my favourite activity was using nets to catch little creatures in the pond. We all thoroughly enjoyed ourselves even though we were absolutely soaking wet. A fun day was held in school today to raise money for two charities - the efforts of Celyn Kenny, a former pupil, to climb Kilimanjaro to raise money for Childreach International, and the Cerddwn Ymlaen sponsored walk in aid of the Welsh Air Ambulance. Year 5 and 6 pupils brought cakes to sell in the hall during the morning, and this afternoon each pupil from the Reception to Year 5 took part in shuttle games on the school field which had been especially set up by Year 6. Thank you very much to those who prepared cakes, to the School Council for organising the day, and to everyone who contributed kindly to two very worthy causes. We welcomed ex-pupil Megan Meredith back to her old school to share her experience of cycling 1000km from north to south of France recently. Now a pupil at Ysgol Penweddig, Megan has retuned following the ten day epic journey across France. So far Megan has raised over £1,250 for local appeal ApêlElain. Thank you Megan for sharing your experiences with us, and for showing us all your interesting photos. We had a very important visitor at our morning assembly today. Mercedes is visiting Aberystwyth from her school in Trelew, Patagonia. Mercedes speaks Spanish and Welsh fluently, receiving Welsh lessons in her school in Patagonia. Thank you Mercedes for your contribution to our assembly (Merecedes read the prayer) and for answering the children's questions during the day. A fantastic day in terms of weather and competition was had by all at the School Sports Day this year. From Nursery to Year 6 the children competed to the best of their ability through running, throwing and jumping in order to win as many points as possible for their team. Winning the Victrix Ludorum this year, for a girl winning the most amount of points for her house, was Madeleine from Year 5; with the Victor Ludorum won by Siôn of Year 6. The victorious house at the end of the day was Dewi (208 points), second Caradog (207 points) and Arthur third with (194 points). Year 6 pupils spent a very enjoyable afternoon on Thursday cooking at Ysgol Penweddig. As part of our History work this term we have been learning about the Second World War, and about food rationing in particular. The challenge for the pupils was to follow recipes from the period in order to create cakes and biscuits. Everyone worked very hard, and the finished products were very tasty. We obviously have a number of talented chefs in Year 6! Thank you to Mrs Menna Lewis and Mrs Griffiths at Ysgol Penweddig for their welcome and assistance. Eloise of Year 2NJ walked to school from her home in Llandre on a wet Friday morning in June. The children of Year 2NJ sponsored her so that she could adopt a snow leopard and a tiger that live in the Himalayan mountains of Asia. These wild animals are in danger of becoming extinct and depend on the WWF to care for them. Eloise raised enough money to adopt two snow leopards and two tigers! She received two cuddly toys as a token of gratitude for her support by the WWF. The Urdd Fun Day returned this year to Aberystwyth, giving Year 6 the chance to have a lot of 'fun' once again! The children had plenty of fun taking part in all sorts of sporting activities, including Zumba, football, cricket, golf, rugby, dodgeball, athletics, basketball, hockey and more! Thank yuo to the Urdd for once again organising such a variety of activities. Following on from their success in the county 50/50 cricket tournament, Year 4 went to Cardiff to compete in the national competition. The team managed to win every one of their three group matches, before losing out in the semi-final. Unlucky, children, but very well done on playing such good cricket during the summer. A big thank you to one of the school's Year 6 pupils, Siôn, on raising over £550 for a local charity. For several months Siôn has been growing his hair in order to raise money for ApêlElain. Then, after growing his hair long, he cut it really really short in front of everyone in the school hall! Year 2 pupils had a very interseting morning at the Canolfan Barcud Centre in Tregaron. The girls put on white pinafores and everyone sat on long benches behind wooden desks. They had to speak English in the classroom. If they spoke Welsh, they had to wear the ‘Welsh Not’ around their necks. The children did some sums and recited the 2 times table using an abacus. The teacher wrote English words on the blackboard with chalk. Before they answered a question, they had to say ‘Please Sir..’It was all quite an experience.